This is a land known very much for its bustling city center Napoli, ancient Pompeii and their surrounding natural attractions like Mount Vesuvius, the Amalfi Coast and the Island of Capri. Stunning coastlines reminiscent of Sicily and Calabria and a contrasting interior with more similarities to Piemonte with 2000ft elevation massifs. 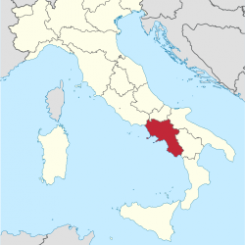 Loosely translated, Campania is the “fortunate country” referring to its legendary fertile soil that provides an abundance of foods including artichokes, citrus, San Marzano tomatoes, chestnuts, hazelnuts and even tobacco. Accompanying its vast agricultural diversity is of course grape vines, which in Campania have one of the longest viticultural histories in the country. Dating back to the 13th Century BC the Greeks were responsible for sparking the wine presence and later the Romans took part in documenting and spreading it. Historically grapes were always treated as a commodity here, but in the early 1990s the region was catapulted towards low yields and quality. It is now considered a noble area for DOCG white wine production and its age worthy “Barolo of the South”…Taurasi.